318 pages | 91 B/W Illus. The growth of cities poses ever-increasing challenges for the natural environment on which they impact and depend, not only within their boundaries but also in surrounding peri-urban areas. Landscape ecology – the study of interactions across space and time between the structure and function of physical, biological and cultural components of landscapes – has a pivotal role to play in identifying sustainable solutions. 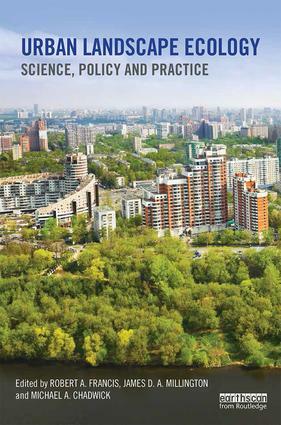 This book brings together examples of research at the cutting edge of urban landscape ecology across multiple contexts that investigate the state, maintenance and restoration of healthy and functional natural environments across urban and peri-urban landscapes. An explicit focus is on urban landscapes in contrast to other books which have considered urban ecosystems and ecology without specific focus on spatial connections. It integrates research and perspectives from across academia, public and private practitioners of urban conservation, planning and design. It provides a much needed summary of current thinking on how urban landscapes can provide the foundation of sustained economic growth, prospering communities and personal well-being. Robert A. Francis is Senior Lecturer in Ecology, King’s College London, UK. James D. A. Millington is a Lecturer in Physical Geography, King’s College London, UK. Michael A. Chadwick is a Lecturer in Freshwater Ecology, King’s College London, UK. This series includes a wide range of inter-disciplinary approaches to urban ecology. It includes textbooks, research monographs and titles aimed at professionals, NGOs and policy-makers. Authors or editors of potential new titles should contact Hannah Ferguson, Editor (Hannah.Ferguson@tandf.co.uk).